Another developmental release of the upcoming openSUSE 10.3 was released a few days ago with some improvements, some regressions, and some minor eye candy changes. I didn't test Beta 1 as it seemed to be released too soon after Alpha 7 (for me to cover), so I had to test Beta 2. I did download the approximate 550 MB delta file for it though, so I was ready for the 515 MB delta for Beta 2. I decided to test this release on the HP Pavillion laptop I received for Christmas as I had overwritten 10.2 for a previous review and I missed having an openSUSE install on it. Another reason this seemed like the time was that developers wanted LCD brightness adjustment, suspend, and the Grub installation tested. Also, long story short, I had lost access to the Windows XP partition at some point and needed to restore it first. So, this was the perfect time to test their Grub installation. The boot screen and splash haven't changed since Alpha 7, but there were a few tiny changes in the install routine. It now offers the option of setting up installation sources before parcing the rpm database. This would be handy for network or internet installs, but I was outta luck as my wireless ethernet chip requires the Windows drivers. Another new element I noticed that must have shown up either in Beta 1 or 2 was that the Release Notes are available during package installation accessed from a third tab. If you'll recall, the first tab is Slideshow and the second is Details. I think that's a great idea as that's when one really has the time and inclination to read them. I had a bit of trouble during package selection. First of all the free space indicator didn't work, but I wasn't too worried as I was using a 10 GB partition. What did cause more trouble was when I clicked the checkbox to install XFCE. The busy cursor remained for quite a while and I walked away. When I returned, the install had aborted and the machine was sitting at the ascii 'something went wrong' screen. To verify, I tried again and sure enough the install aborts when I try to select XFCE for installation. Some other smaller choices seemed to take a bit longer than usual making me a bit nervous as well such as Laptop and Console Tools. But I was able to select them and some of the other usuals I like such as C/C++ Development and Linux Kernel Development. The aborted install is probably an improvement over my last install when I tried to select KDE4 for installation and the installer hung indefinitely. Then finally came time to test the bootloader installation and functionality. During configuration it appeared that openSUSE saw and included three of the four other Linux installs and my one Windows install. The Linux installs included Freespire 2.0 that it identified by a generic label, Mepis 6.5 that it identified as Ubuntu, and Elive 1.0. The one it didn't seem to see was Slackware 11.0. Mepis and Freespire had its boot files in a centralized /boot partition that I told the installer about and Elive and Slackware were previously chainloaded. openSUSE would install its files onto this shared /boot partition. After installation only Elive and Windows would boot out the distros offered in the plain white text on black Grub menu. Slack wasn't offered and the rest resulted in "file not found" errors, including the openSUSE I just installed. I wouldn't have been too surprized if Grub had had a few problems with my set up as it is confusing, but I was kinda shocked that it couldn't boot its own distro. Fortunately, I could boot Elive and from there I fixed the Grub menu.lst file. I'm not sure, but I think the problem was its using device names like /dev/disk/by-id/scsi-SATA_ST98823AS_5PK3C8ZJ-part6. When I changed them back to entries like /dev/sda6 all was well. In fact, I then had the slick graphical openSUSE Grub screen and splashes. So, anyway, it looks like more work is needed on Grub. At the desktop I was quite tickled to see the new, if temporary, wallpaper being used. I don't presume to think the developers read my last report and changed it because of my being creeped-out, but it was still nice. The windecs are still blue, but those will probably at least get a color change to match. On the KDE desktop we find a new icon labeled Online Help. This opens a browser to openSUSE's site with four categories linking to areas of help. These include online Documentation, Chat & Help (in the form of IRC), Mailing Lists (list of lists), and Discussion Forums. I think that's a nice addition and very well done. 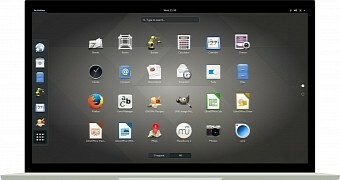 I was glad to see that, they just need to add the icon to the GNOME desktop now. Speaking of Gnome, the Network Manager applet worked good and the Yast Control Center and corresponding modules have widgets to match other Gnome components. I'm not sure how long it's been like that as I don't use Gnome very much and I suppose I assumed its appearance would be the same as in KDE. Regardless of how long this little touch has been in place, it's worth a mention. Although I did get various gtk warnings when I shut the windows. Another item developers wanted tested was the new implementation of HAL's handling of devices, particularly removeable USB sticks. When inserting a USB stick in KDE a 'what to do' dialog opens and it will mount and allow read and write for the user, but no icon appears on the desktop. One can still umount graphically from the My Computer screen. Under Gnome it automagically mounts and opens a window in the main directory. I could read and write to it as desired as user. An icon appeared on the desktop and I could umount from its right-click menu. So, it's getting there. Yet another area of interest for developers was suspend. In tests here I found suspend to ram inoperative. When attempted, a screensaver starts and I heard a telltale soundbyte to indicate that a window had popped open. The error said something about error 127 and the log stated 'machine unknown.' Suspend to disk worked much better. While the machine was being put to sleep, a cute splash appeared. It featured a backwards progressing progress bar with an image of a sleeping Tux. Upon waking the machine, we just get the standard openSUSE silent boot splash. So, in summation, suspend to disk works good while suspend to ram bombs out. Also, the LCD dim/brightness function did operate as hoped. I could adjust it manually and the screen would dim automagically when removing the a/c power source and brighten upon replugging. Problems with the online updater continue. I attempted to add an update source through Online Update Configuration in the Yast Control Center, but it only resulted in an error. I was able to add additional online repositories for the software manager. Another continuing no-go was with the Windows installer. I'm still getting that same ole Cannot copy E:\boot\i386\loader\initrd to C:\opensuse\initrd error. One new bug I experienced was trying to log out or switch user from Gnome. The window would open, but clicking the preferred option did nothing. I had to ctrl+alt+backspace out of Gnome. Similarly, this is the first release of openSUSE that would hang on shutdown. - Move gconf plugin into compiz-gnome package. - Update text files and images. - Obsolete the gcc41 packages from the 10.2. * Intel wifi card support: iwl3945-ucode and iwl4965-ucode packages aren't installed automatically. Make sure to install them manually, in order to enable your Intel wireless cards. So once again we have some new insights to where the developers are headed and again they have to sort through lots of bugs to get there. I have no doubts the Grub issues will be fixed pronto, but I'm starting to worry a bit about the updater and the windows installer. But all in all it's shaping up quite nicely and there's still some of time left on the path to the best openSUSE yet. I have more screenshots in the gallery and my previous coverage can be found here. Submitted by roach of discord on Sunday 26th of August 2007 08:23:34 PM. Good review..but oddly enough I didn't experience alot of the problems you did. For me, all of the boot entries in grub worked fine (although I only had SuSE and Kubuntu. The new updater worked fine for me as well..and so did adding repos. I actually added a handful and installed mp3 support and a few other programs. The shutdown didn't freeze for me either. Beta 2 has been pretty stable for me thus far. Submitted by srlinuxx on Monday 27th of August 2007 02:30:47 AM. But the updater is different than the software manager. I could add repos through the "Software Repositories" - I added two factory repos. But the "Online Update Configuration" is what's still broken - at least in tests here. Submitted by roach of discord on Monday 27th of August 2007 05:02:34 AM. Oh that makes sense. Yes, that part IS broken, you're right. aside from that it seems to be looking good. Still some bugs as you pointed out..but if they can zap most of them, I'm thinking 10.3 is going to be pretty nice .